Rahul Panat, associate professor of mechanical engineering, enjoys the buzzing atmosphere of educational institutions, where students collaborate with faculty and ideas constantly sweep through campus. At Carnegie Mellon, Panat uses advanced aerosol jet technology to study 3-D printing processes at the nano and microscales. But before Panat entered the realm of teaching, he spent 10 years conducting research at Intel—a multi-national tech company—expanding upon the knowledge he acquired as a Ph.D. student in applied mechanics at the University of Illinois, Urbana-Champaign. 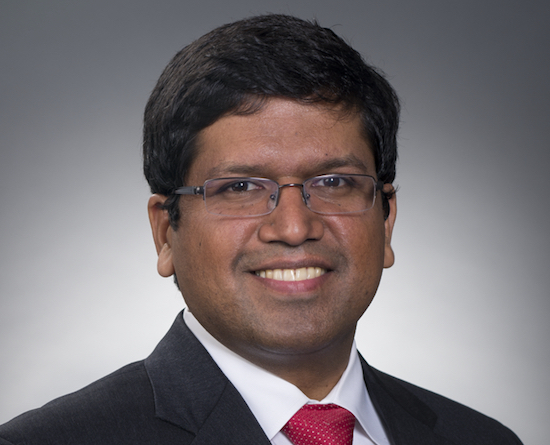 As a research and development (R&D) engineer at Intel, Panat focused his work on different areas of microprocessor manufacturing such as high density interconnects and 3-D packaging. He also helped develop the world’s first halogen-free green integrated circuit (IC) chip by eliminating brominated flame retardants from its constituents. Rahul Panat is a new faculty member in the Department of Mechanical Engineering. Although he was conducting cutting-edge research at Intel, Panat eventually returned to higher education to fulfill his long-term goal of teaching and mentoring students. He began his academic career as an adjunct faculty member at Arizona State University, where he studied the structure of nanomaterials for lithium-ion batteries, before moving to Washington State University, where he focused on nanoparticle 3-D printing. At WSU, Panat and his colleagues created a revolutionary manufacturing method that produces 3-D structures from the nano-to-centimeter scale. This method uses advanced aerosol jet technology to create fog-like structures by capturing nanoparticles in tiny liquid droplets. Once these structures are made and the droplets are deposited in space, the printer uses heat to evaporate the liquid, leaving only the nanoparticles behind to form complex, strong, and lightweight microstructures. According to Panat, 3-D printing at the nanoscale has applications in many research areas such as lithium-ion batteries. My passions were teaching, research, and mentoring students because in a student-centric atmosphere, you can shape somebody’s life for the better. That’s such a powerful concept. In 2017, Panat joined Carnegie Mellon’s mechanical engineering department to continue his additive manufacturing research at CMU’s NextManufacturing Center while also mentoring students in the classroom. This semester, in his advanced mechanical design course, Panat teaches his students the fundamentals of mechanical design by making connections to real-world industrial applications. As an associate professor of mechanical engineering, Panat is now pursuing both of his passions right here at CMU: research and teaching.